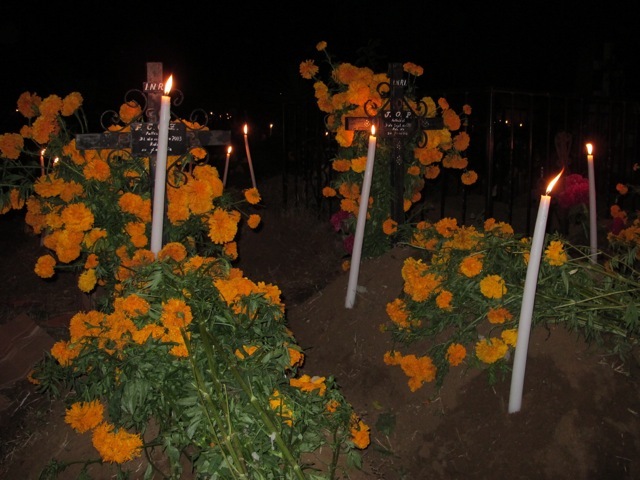 As we have done in previous years, we returned to San Antonino Castillo Velasco on November 1 to watch families begin the preparation of the graves of their loved ones for Día de los Muertos. In a process unique to this pueblo known for the cultivation of flowers, family members mix the area’s very fine dirt with water; spread it on the top and sides of the grave; smooth it with a trowel, as if they were getting ready to lay tile; using a nail, they outline designs and religious imagery into the mud coating; and then use flowers (fresh and dried), to “paint” the scene. This year’s late rainy season brought torrential rains on November 2 and it must have interrupted the decorating, because when we returned on November 3, at the same time as usual, there was still much work to be done. However, no one seemed the least perturbed; peace, tranquility, and quiet joy prevailed and, as always, it enveloped us. Muchisimas gracias to all my readers. Thank you for stopping by, your perceptive comments, and your encouragement. Peace and joy in 2012, if not in the world, at least in your heart! 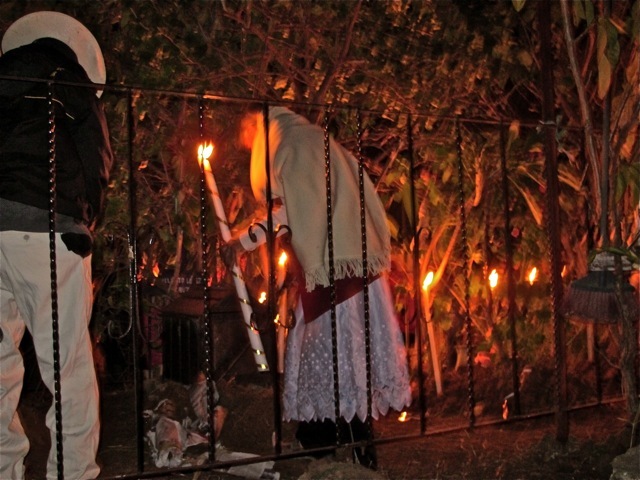 Today is Thanksgiving in los Estados Unidos de América… and besides my wonderful family and friends, I am so grateful to see and experience places like San Antonino Castillo Velasco during los Días de Muertos. 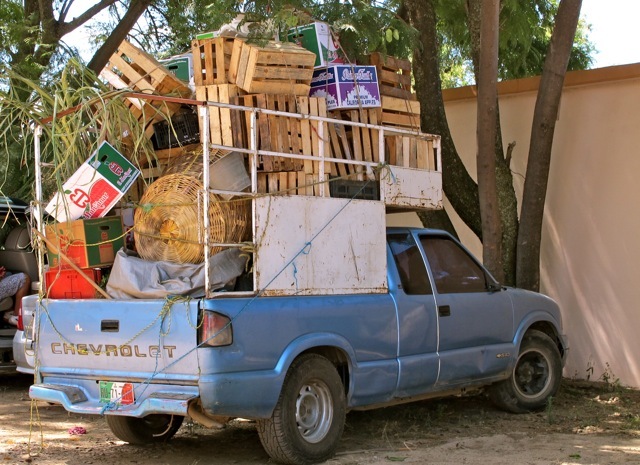 ¡Feliz Acción de Gracias a todos! 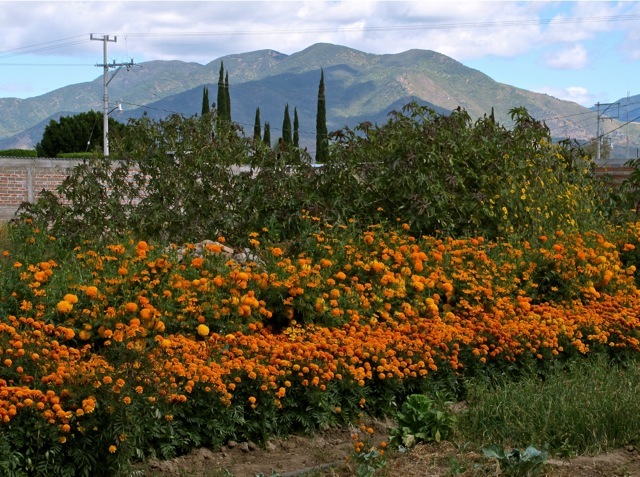 San Antonino Castillo Velasco, a Zapotec community near Ocotlán, is a village known for its flowers. They are, no doubt, the inspiration for beautifully embroidered linens and clothing sold in the mercados and found in museum collections. And, a specialty is the “flor inmortal” (immortal flower), so named because, even when dried, it retains its brilliant colors. 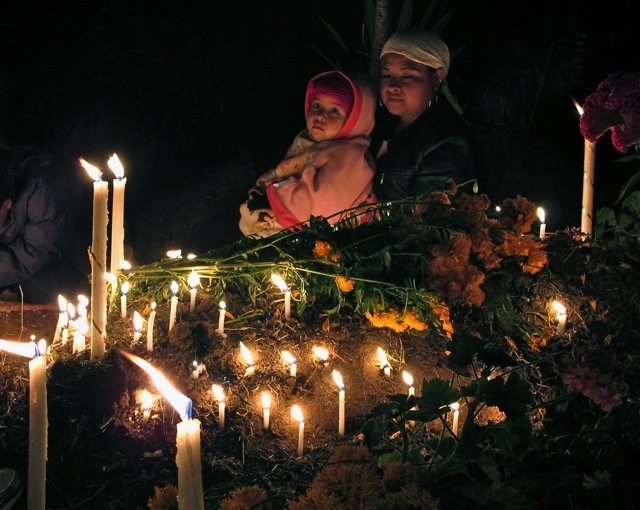 They are used to create intricately designed figures on display December 23 in the city of Oaxaca, during Noche de Rábanos and to decorate the graves of loved ones during Días de Muertos in San Antonino. 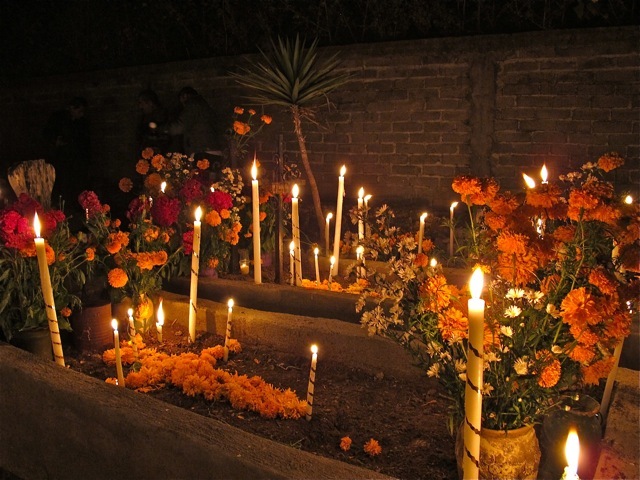 As I’ve previously mentioned, each village seems to have its own unique traditions for the Days of the Dead. 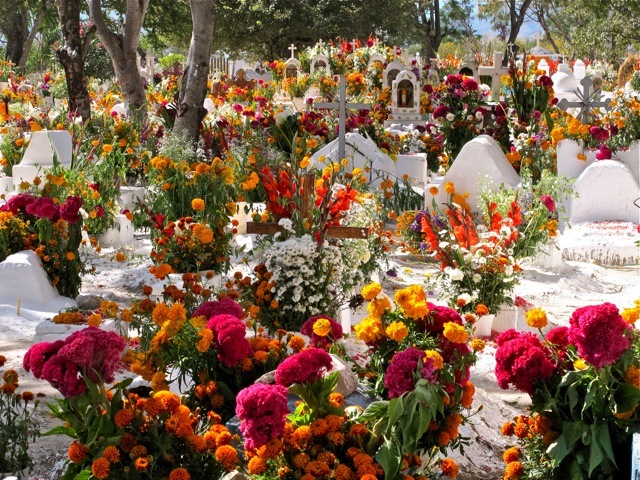 Villagers here mix the area’s very fine dirt with water, cover the graves, use a trowel to smooth it, outline designs and religious imagery into the dried coating, and then use flowers (fresh and dried), to paint the scene. Entire families are involved, young and old, and the atmosphere is filled with joy, purpose, and most of all… Love. 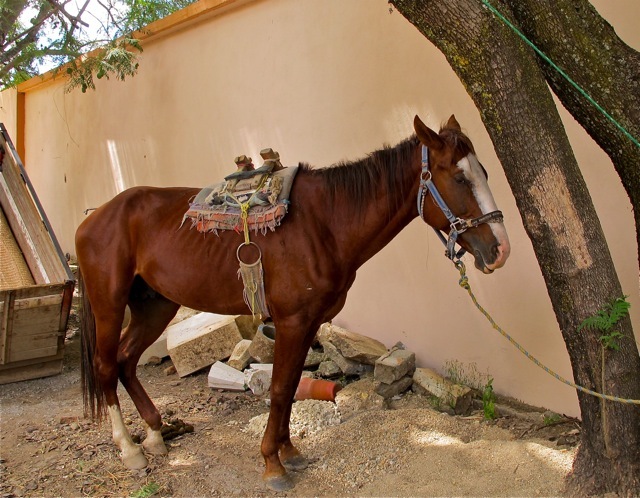 For a very special moment, that is a metaphor the two days spent at San Antonino, see Chris’s post, Moments make a life..
San Antonino Castillo Velasco, to be precise. 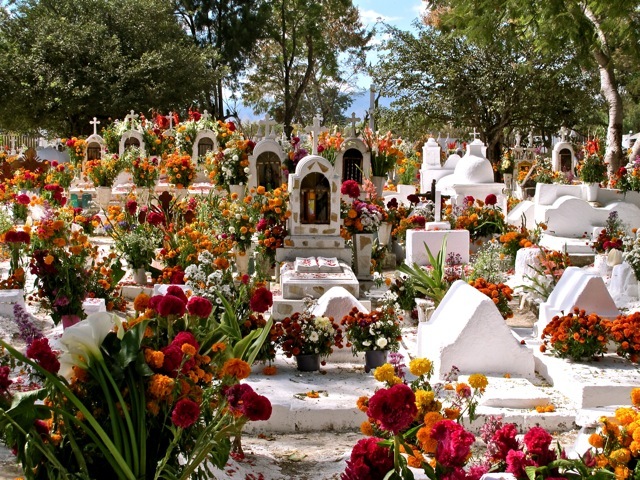 Young and old converged on the municipal cemetery to decorate the graves with the magenta of cockscomb and yellow to orange to rust of marigolds (cempazúchil or zempoalxochitl) grown in nearby fields. Laughter, artistry, and pride followed. Stay tuned for images of their meticulous labors of love. On the eleventh day of the eleventh month at the eleventh hour, I attended a press conference for the official unveiling of the website for a new play. 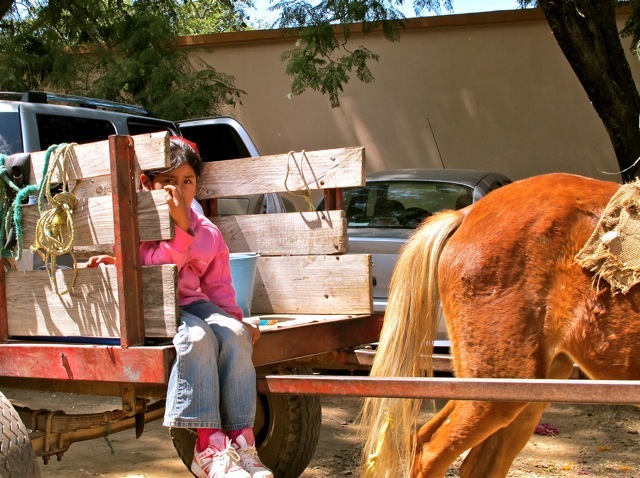 The play, La [medio] diezmada (the half-decimated), will have its world premiere on December 22 at the Teatro Juárez in Oaxaca. 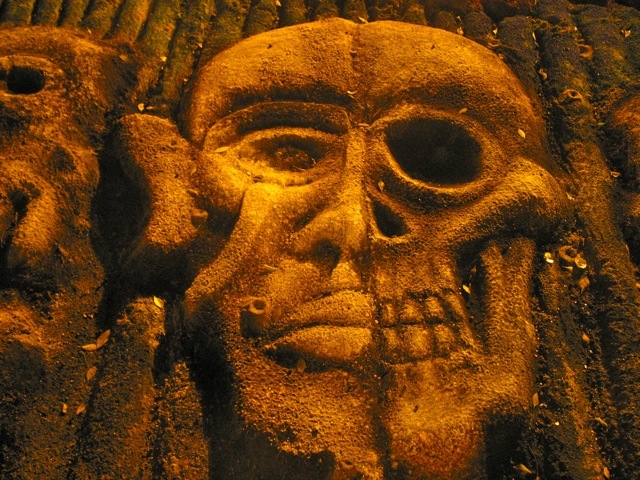 One of the inspirations for writer/director/producer, Kurt Hackbarth, was a photo he had seen of a half-alive/half-dead face in a sand painting. 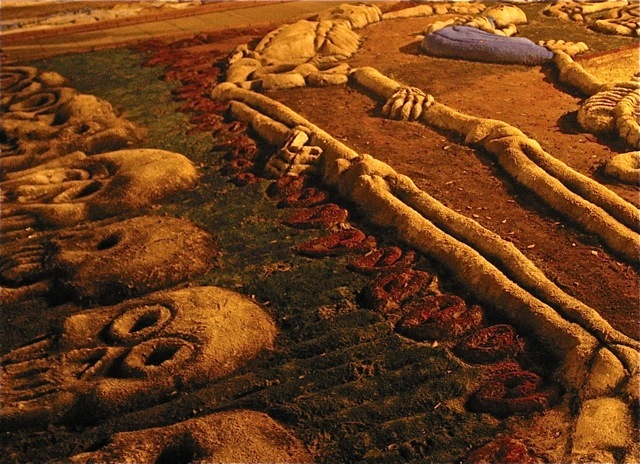 In one of those amazing coincidences, I’d actually photographed the very same tapete de arena laid out on the Alameda in Oaxaca during Los días de muertos in 2009. … and I cropped and used for the website banner. 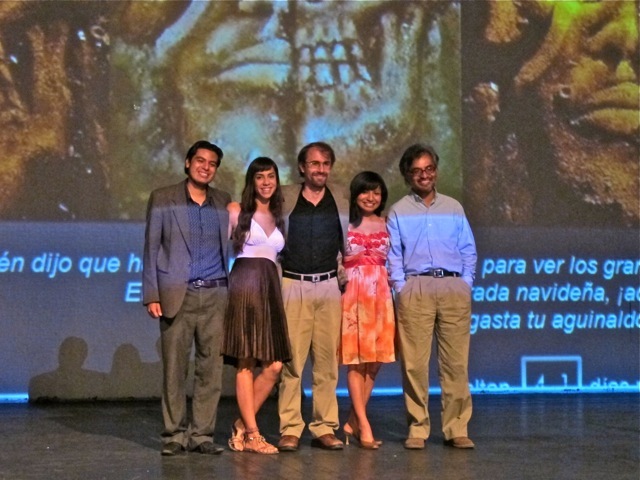 If you find yourself in Oaxaca on December 22, I encourage you to attend this world premiere! By the way, it’s a comedy! 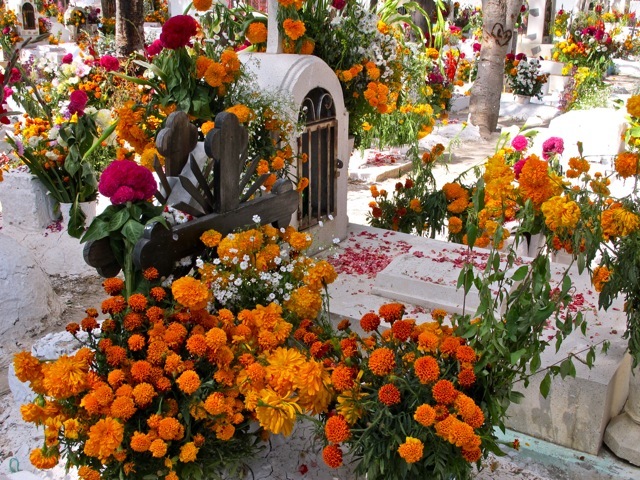 Entering their Panteón, the play of light and shadow and explosion of greens, reds, oranges, yellows, and magentas against whitewashed graves was stunning. 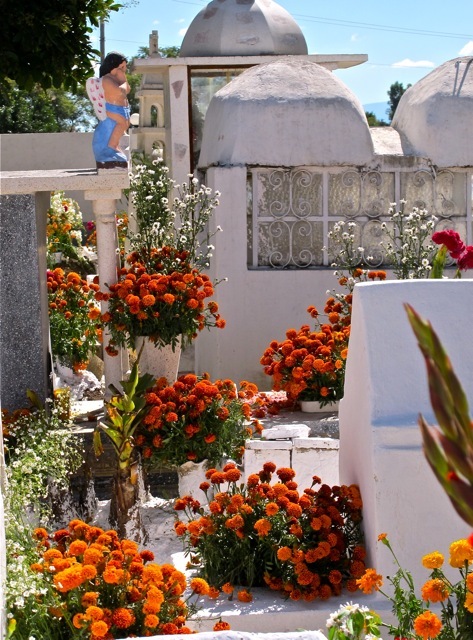 Unique artistry was evident in each of the cemeteries we visited. 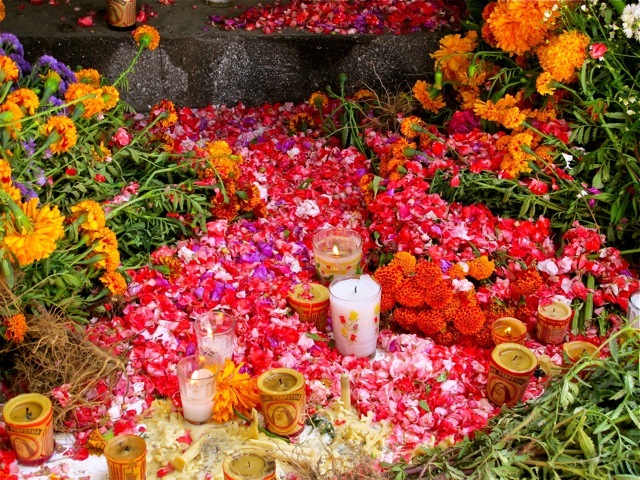 One of the special and fragrant features here was the rose petals scattered atop graves. 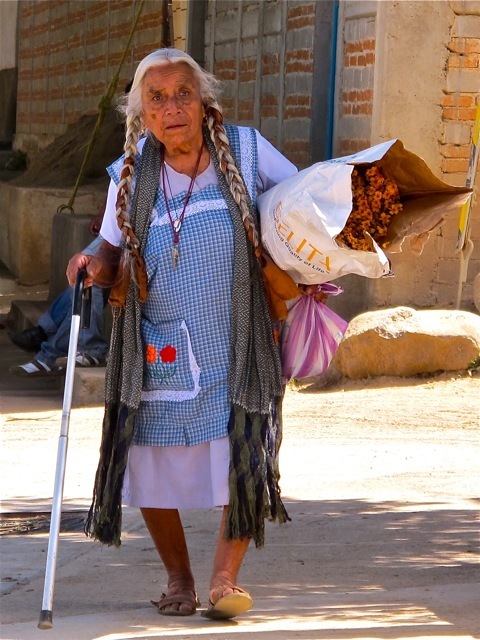 Have I mentioned… No matter where one seems to go in Oaxaca, the senses are filled! 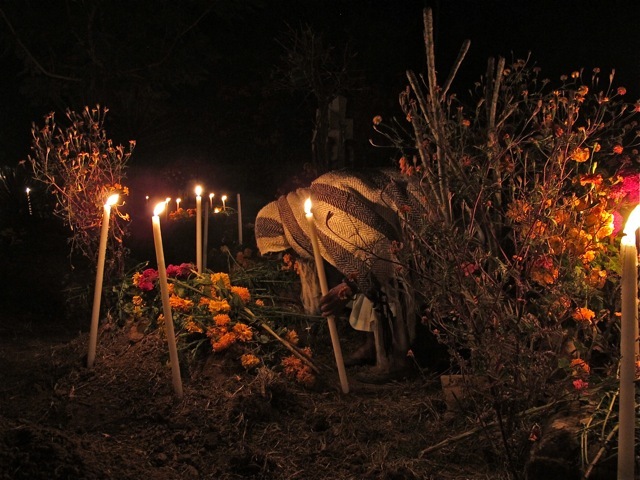 We tagged along with the band, dancers, and their friends and neighbors, up and down the hills, navigating steep dirt paths, as they played, danced, drank mezcal, and stopped in front yards for much-needed rest and refreshments of caldo de pollo (chicken soup), pan de muerto (Days of the Dead bread), and mezcal… of course! By the way, did I mention, these guys and (one) gal, had been playing and dancing all night long?!! The tapetes de arena are finished and cover the stone flooring of the Plaza de la Danza. Always difficult to photograph, the following are an experiment in cropping. 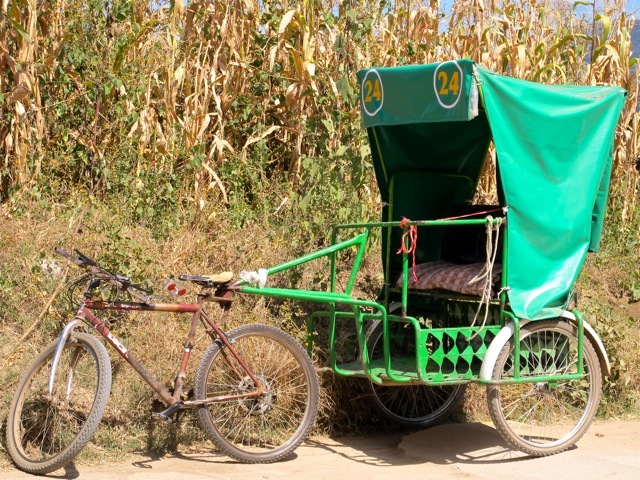 Several other organizations participated and among the unsigned are tapetes de arena from Casa de las Artesanías de Oaxaca, Sociedad Civil de Maestros Oaxaqueños del Arte Popular, and Grupo Colectivo Camaleón. A happy and safe Halloween! By the way, this year they are in the Plaza de la Danza and, as I write, the music of the Orchestra Infantil Libertad (a children’s orchestra) is serenading the completed tapetes de arena, the audience gathered at the Plaza de la Danza, and yours truly, sitting comfortably at her desk.